We were very happy with it. We packed all our gear into canoe barrels that we’d borrowed from friends and still had lots of room left over. The very first portage trail was tough. Even a little rut in the trail is tricky when you’re pushing a long canoe weighted down with 60 pounds of gear. And that 60 pounds was just our food alone! Once we got the hang of it, everything went smoothly. Only once on the whole trip did we “capsize” (luckily it was on land!) but we managed to grab the canoe quickly enough to keep it from tumbling down a hillside. 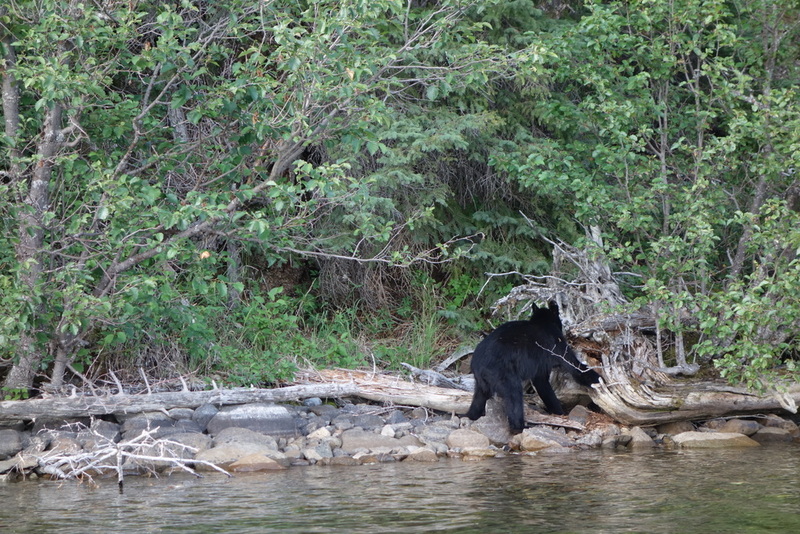 One of the best parts of paddling through such remote scenery is the great wildlife viewing opportunities. After just a few hours of paddling we saw a black bear ripping apart a log and eating the ants inside. 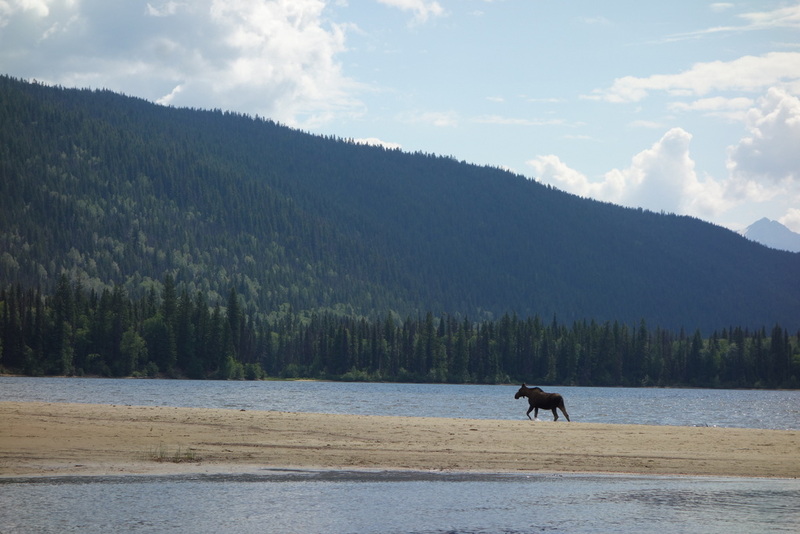 Another day we saw a moose and her baby wading across the water. An otter crunched a freshly caught fish only feet from our boat then snorted at us when it realized how close we were. Loons and owls sang us to sleep each night. With all that food we’d packed, we ate very well. You can load a lot into a canoe, and we sure did. One night we enjoyed freshly cooked pasta with steak and sun-dried tomatoes. Another we had spicy tacos, and another salmon cooked on the open fire. After three days of paddling on surprisingly calm lakes we arrived at the exciting “whitewater” sections of the circuit. These turned out to be pretty tame, although the most difficult we’d paddled yet in our young canoeing careers. Before tackling the “Chute” with our loaded canoe we donned our swimsuits and life jackets and floated through the rapids. Then we jumped in with the canoe, cruised through the rapids effortlessly and headed down through the “Roller Coaster”. We sailed through it all smoothly, but seeing broken boats sunken in the water and wrapped around rocks kept us (at least one of us anyway!) constantly alert. Along the circuit there are a number of old trapper cabins, rich in history, but filled with mosquitoes and mice. We stopped at a cabin on McCleary Lake with fantastic views of glacier-covered mountains and moose wandering though marshes. The weather was so perfect that we chose to camp outside in the clear cool air. Each day seemed to get a little hotter than the one before and we finally got treated to our first thunderstorm on Day-5. Amazingly, despite being right under the storm clouds with thunder and lightening crashing down, the storm just glanced us, giving an amazing sunset. Strangely, the trail to Cariboo Falls had a “closed” sign at the trailhead. Not to be deterred, we continued on finding it in perfect condition. And we’re glad we did. The 25m high falls are spectacular. On our second last day we awoke to a beautifully warm day with calm water. Within a few hours of paddling, though, thunderheads started to build. Sharp flashes of lightening and roaring thunder soon turned into pounding rain. This is more like the weather we expected! 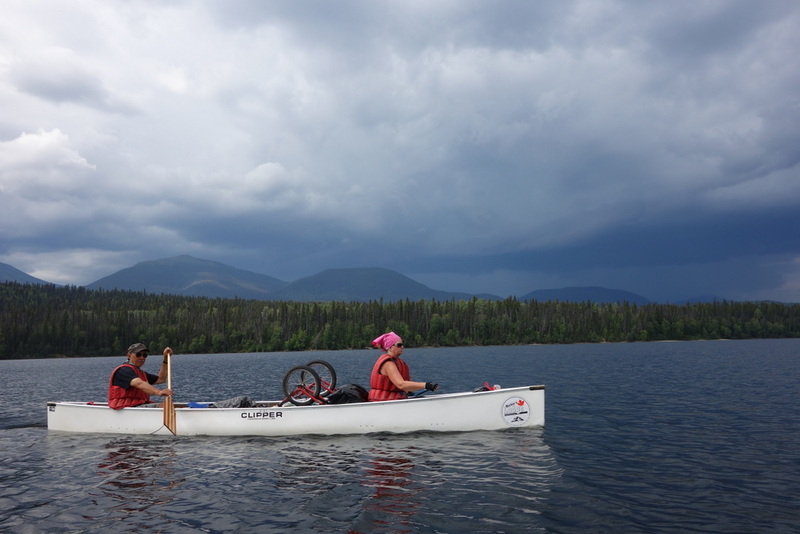 We took shelter on shore under some large trees to don our rain gear and then continued paddling. We could see clear skies up ahead and were once again treated to a beautifully calm day just in time to set up camp and relax for the evening. Our final day was once again beautifully calm. Paddling across glassy water feels so fast. Taking a week to complete the circuit felt just right. 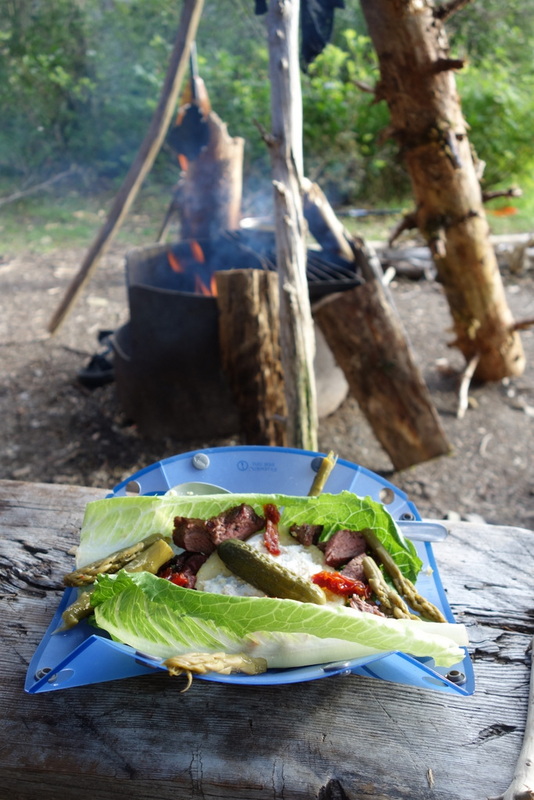 We were able to go at a nice relaxed pace and to enjoy cooking over campfires each night. We met many people who were doing the trip for their second or third or even twentieth time! Maybe some day we’ll return as well. But the amazing weather we had must be a thing of rarity. Next time I’m sure we’ll battle wind and waves and driving rain. And I bet we’ll enjoy it just as much. Wildlife seen and heard: black bears, moose, otters, loons, harlequin ducks, owls, kingfishers, and many other birds. We think we heard wolves howling one night! 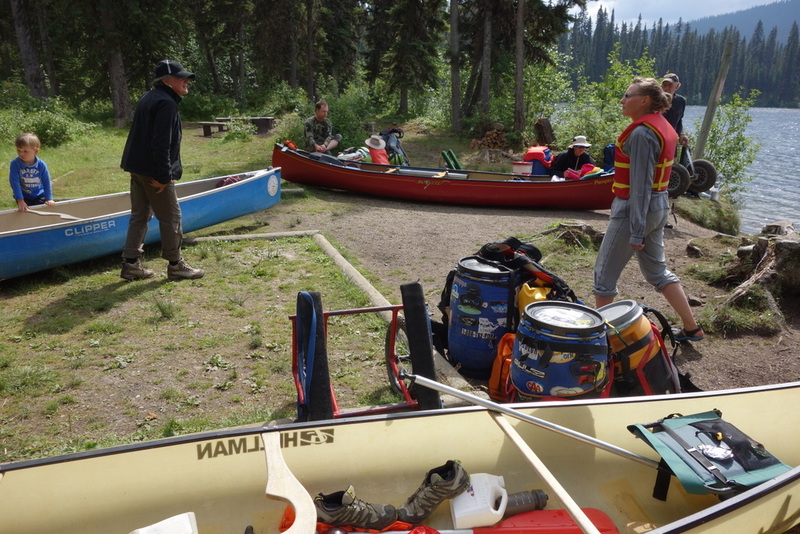 Portage – Registration Center to Kibbee Lake – 2.4 km – Tough start to the trip with uphill and some ruts and potholes. Once you get the hang of it, it’s not so bad. Kibbee Lake – 2.4 km – Nice easy paddling on calm water. 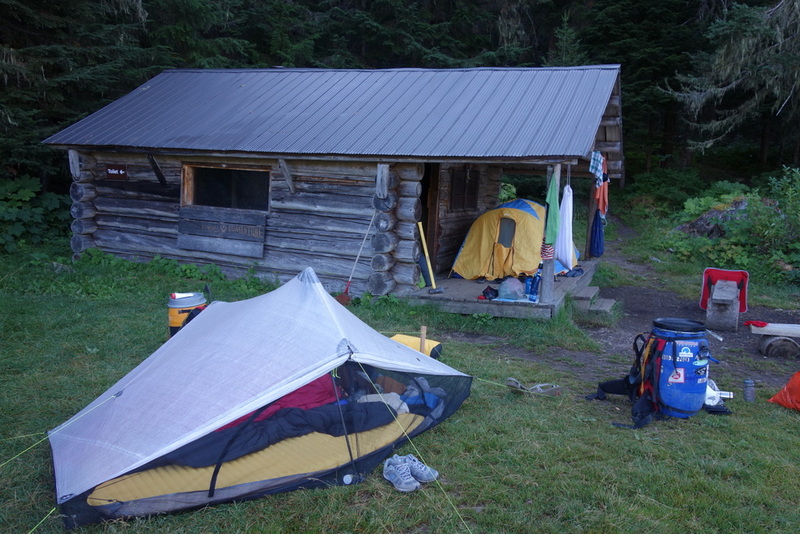 The cabin at campsite #1 and Thompson Lake are well worth visiting. 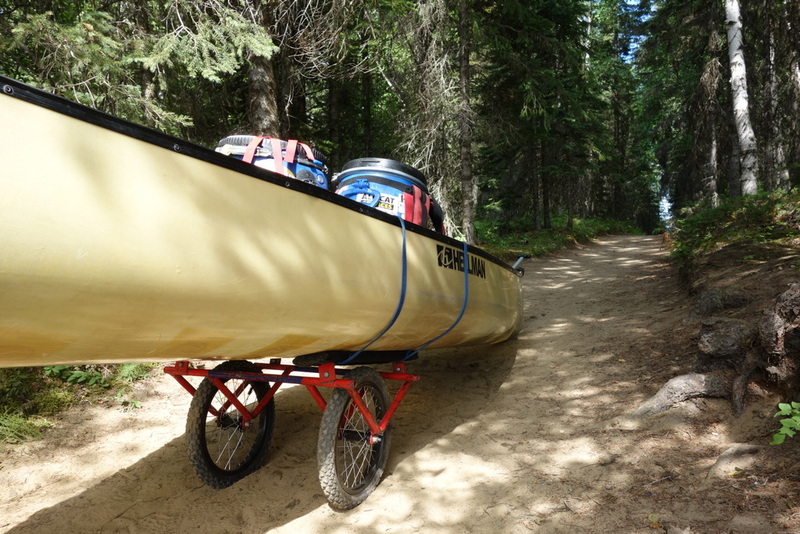 Portage – Kibbee Lake to Indianpoint Lake – 2.0 km – Rougher than the first portage with more potholes and roots to avoid but more gradual. With lots of rain this portage could get really mucky. Indianpoint Lake – 6.4 km – We really started to get a sense of the circuit here with great views all around. This is where we saw the black bear eating ants. A campsite right on the lake would be beautiful but we continued onto #9 at the very end since everything up to that point was full. Still very enjoyable. Portage – Indianpoint Lake to Isaac Lake – 1.6 km – Roughest portage yet but we really started to get the hang of it by this point. Have one person push the canoe from behind and the other assist on steep uphill sections and over ruts and potholes. Isaac Lake to Campsite #19 – about 10 km – Beautiful views the whole way. Stop in Wolverine Bay to relax on the beach. This would also be a great place to camp, especially on a stormy day since it has a comfortable shelter and wood stove. All the campgrounds we stopped at along Isaac Lake looked great. Paddled about 15 km today. Be sure to visit the waterfall on the other side of the lake opposite campsite #18. Look for the stream flowing into the water and the obvious trail heading up to the falls. 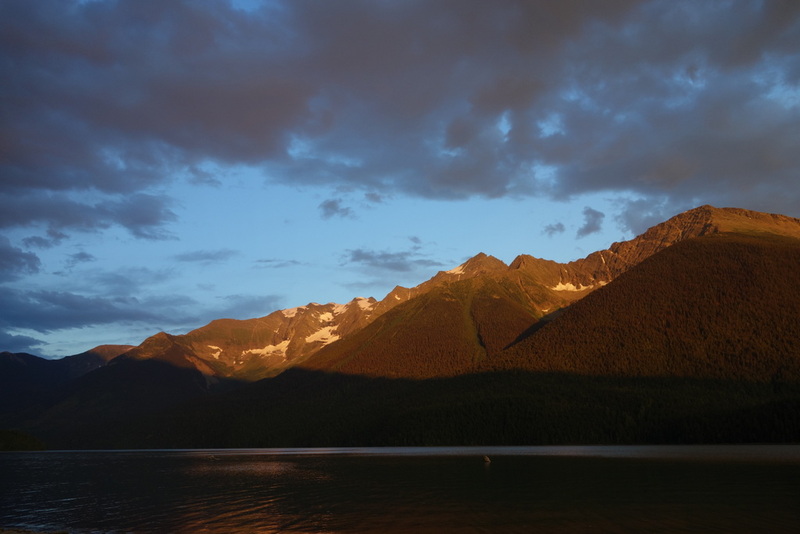 Paddle close to shore and peer deep into the water where you’ll see huge logs smashed by avalanches. Campground to the end of Isaac Lake – about 7 km – the views keep getting better and better. Watch for glacier-covered mountains and spectacular avalanche chutes. The “Chute” and “Roller Coaster” – whitewater sections – swim down the Chute first to get a feel for it, then run it with your canoe. Practice some eddy turns then head down through the Roller Coaster, staying to the left. Portage – around Isaac Falls – 1.2 km – The roughest portage yet, steep and narrow in places with some tight turns. This is where the canoe tipped and we had some gear fall out. It’s a great idea to have a second person help stabilize the canoe by standing at the side toward the front. There’s a little side-trail to Isaac Falls. Leave the canoe at the side of the trail. Well worth the visit and you’ll see why you’re happy to did the portage. The woodlot for this section of the circuit was located in the middle of the portage trail. Grab a few pieces but be really careful about overloading your canoe as the trail drops down quickly. Better yet, finish the portage then head back up and take an armful of wood – it’s not that far. McCleary Lake – 1.2 km – A nice easy paddle. The cabin is a great place to stop for the night and it has wonderful views. 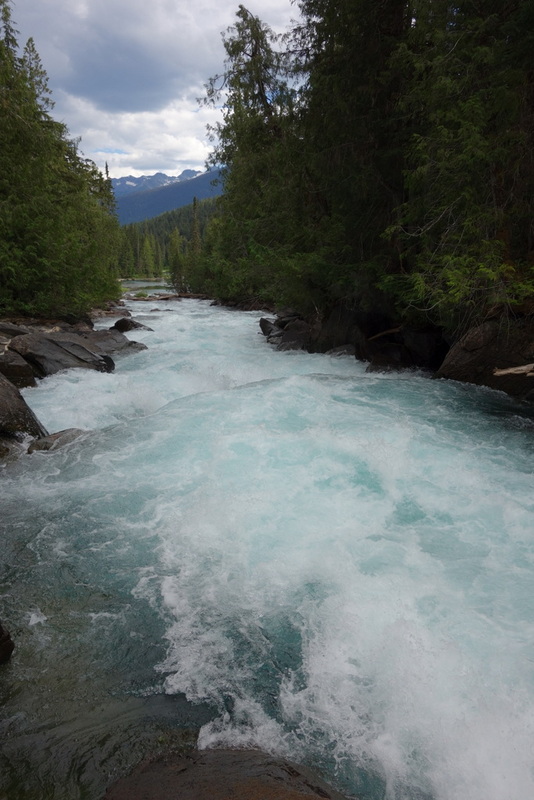 Cariboo River – 5.2 km – The current flows quickly and smoothly but the water is murky from glacial silt. Watch carefully for sweepers and deadheads. We saw more than one destroyed canoe smashed into rocks on this river section. Lanezi Lake – 14.8 km – The only wind we really encountered was here. It picked up quickly and gave us a good workout but died off just as fast. Stay near shore, not just for safety but for the great views. On the near side you see really interesting rock formations and on the other, spectacular mountain views. One whole side of the mountain is an avalanche slope. Campground #37 was really nice with great views and a sandy beach. Cariboo River – 1.2 km – This hardly feels like a river. More like two lakes joined together by a narrow section. Sandy Lake – 4.8 km – After the amazing views along Lanezi Lake, Sandy Lake feels much drier and more tame. But there’s still lots to see including great wildlife viewing. 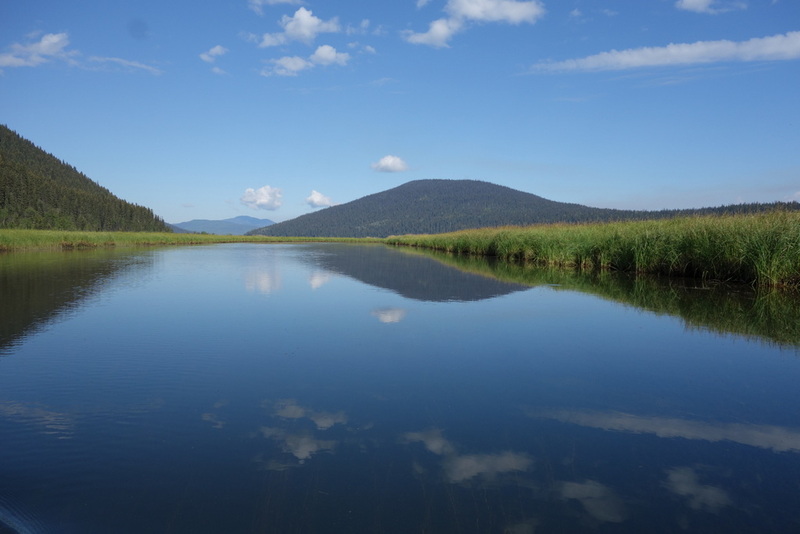 Cariboo River – 3.6 km – nice easy stretch of river. You’ll almost miss the faster sections you made it through earlier since you’ll have to paddle to get through this one. Unna Lake – A small pleasant lake. 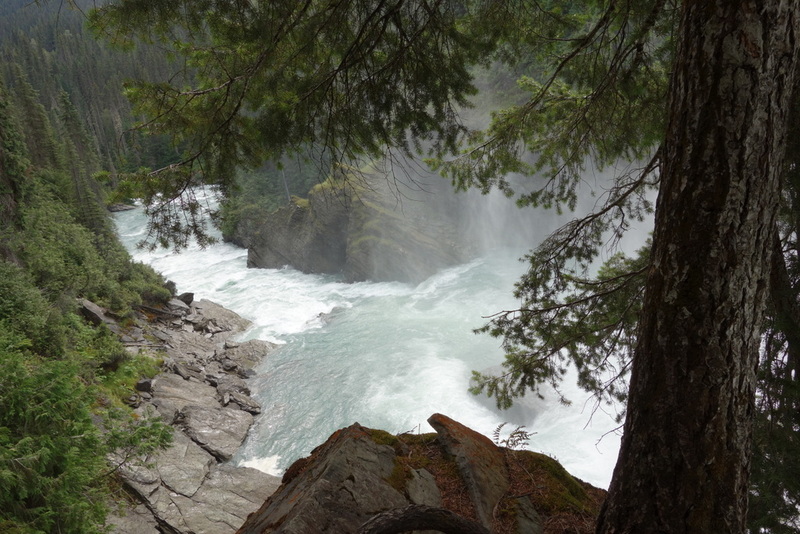 Be sure to visit Cariboo Falls. The trail is easy and the falls are stunning! The campground here is quite large and spread across the beach. It’s unlikely you’ll be alone. Babcock Creek – 0.4 km – A nice narrow winding creek through tall reeds and past a ranger station. Portage – Babcock Creek – 1.2 km – The portages get progressively smoother and flatter on this, the western side, of the circuit. 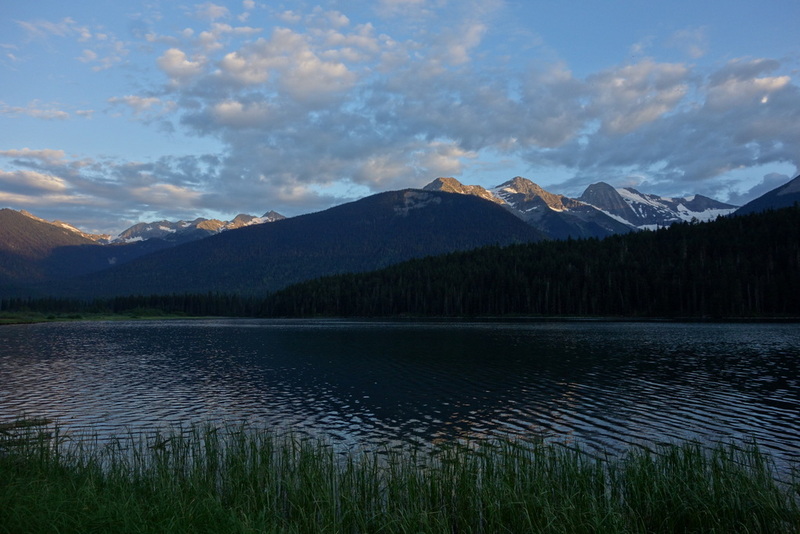 Babcock Lake – 2.8 km – A very pleasant lake and a great place to linger while watching wildlife. 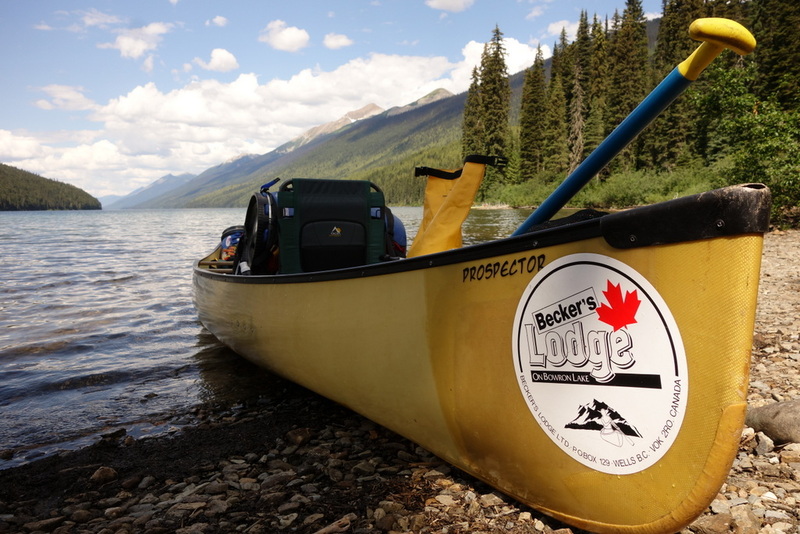 Portage – Babcock Lake to Skoi Lake – 400 m – Easy. Skoi Lake – 0.8 km – Such a small lake it’s easy to skip right over. But this is also a great place to relax and enjoy the sounds and sights of wilderness. 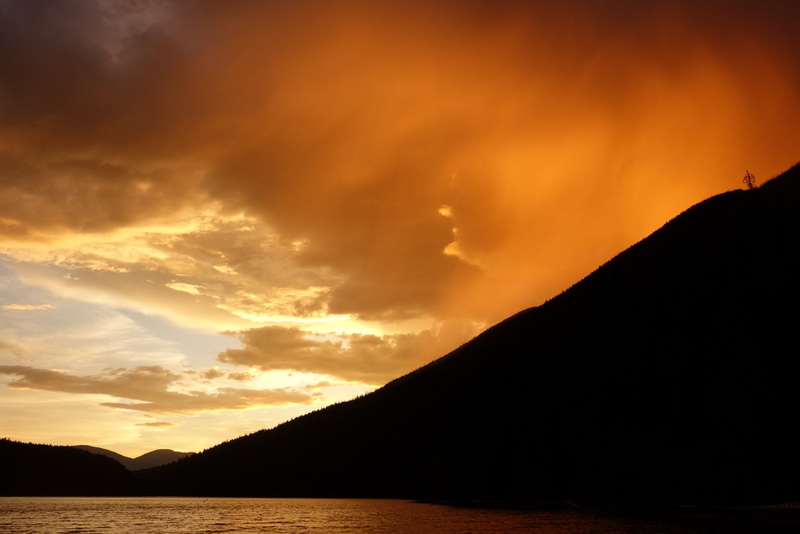 Instead of paddling straight across the lake (which is easy enough), go along the shoreline. 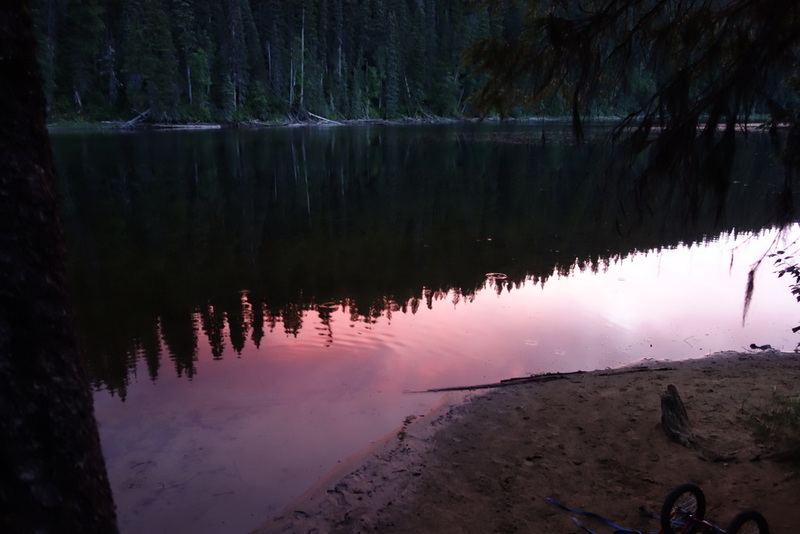 Portage – Skoi Lake to Spectacle Lake – 400 m – Easiest of all. Spectacle Lakes & Swan Lake – 12.8 km – More great views and calm paddling. We definitely saw more people on this side of the circuit but it was still quiet. A sandbar nearly splits off the first Spectacle Lake from the others. Look for a passage at the left end of the sandbar and get out and pull the canoe if needed. We made it through without getting out but stopped to watch a moose run up and down the sandbar! At the northern tip of Pavich Island on Swan Lake there is a woodlot (at least when we visited). You can only see the sign once you’re past the island, so stick to the island’s shore until eventually you see it. We enjoyed Campground #52 and had some luck fishing but Campground #51 looked like it had nicer views. Bowron River – 4 km – There’s a tremendous amount of birdlife to see as you pass through the marshes of Bowron River. It’s exciting to guess which way the water will turn next as it winds its way through the marsh. Easy paddling. 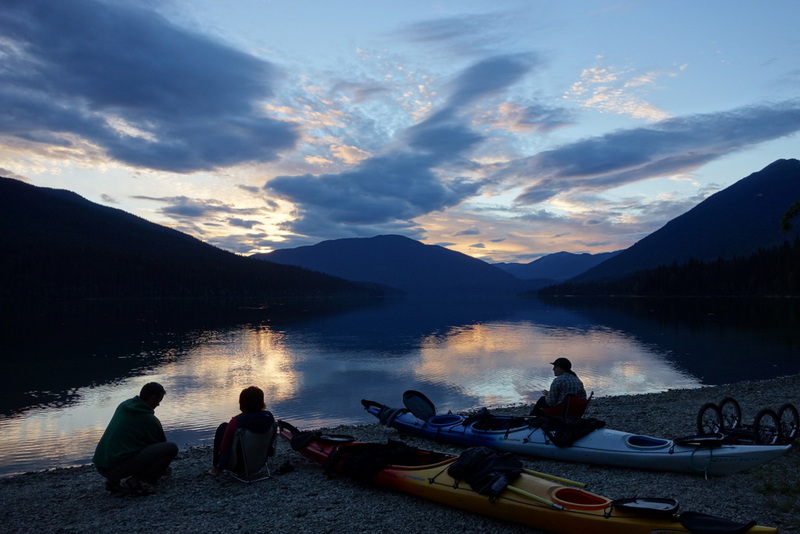 Bowron Lake – 7.2 km – This feels long after so much exciting paddling. You can see the registration center and lodges at the end of the lake nearly the entire time. As power boats go by you feel like you’re coming back to civilization. But keep looking back and remember the great trip you’ve just had.